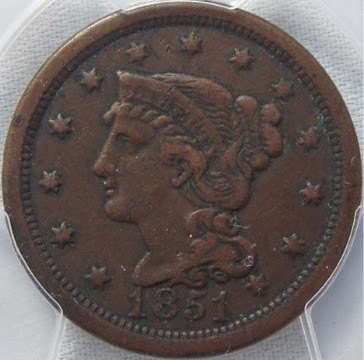 I think it was the large cents that first sparked my interest in collecting coins. These were minted from 1793 to 1857. They are a bit larger than a present day quarter and thicker, so they weigh a little less than twice as much. 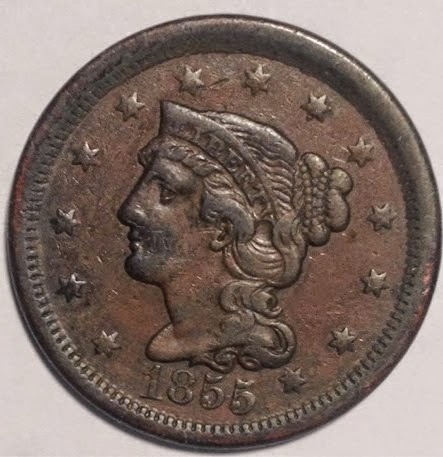 The 1855 is very special to me. It is the only coin that I kept from the collection I inherited as a child. All large cents are fairly rare. 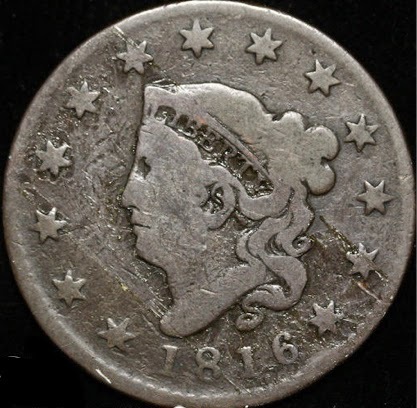 The 1855 example shown here had original mintage of just over a million and a half pieces and it is estimated that only about 7,000 exist today. Toward the end of their existence, people disliked them because of their size and weight, so were anxious to turn them in when the small cents arrived in 1858. Yet these are not very expensive. That particular coin in that condition can be found for $75 or less. If that were a Lincoln cent of similar rarity, it would be twenty times that or more. But there are not a lot of people collecting large cents by date, so prices are relatively low. There are a few people who do collect by date and even by obscure variety, but those folks are very few.